Fitness Square is a fitness center situated in the center of our country - Nagpur. We are dedicated as a fitness center for providing best services and results in nagpur, Our expert team will provide you the best guidance in Weight training, Cardio, Aerobics which will transform YOU into a BETTER YOU. 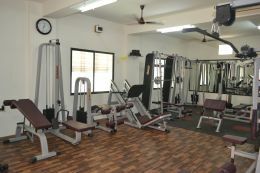 Fitness Square is well equipped with all kinds of weight training machines and cardio equipments for a better and safe workout, the environment of our fitness center is also very encouraging and positively motivated which fill you will the positive motivation too.